Syma X21 is using a brand new core, with a better & stability on performance. Syma X21 with smart & fency appearance, you will be one of the enthusiast. A New Function of One touch to "FLY"
Easy to take off / landing with simply one key on the remote control. Syma makes FLY so easy! The aircraft will always follow the command from the remote control once enter into the headless mode. Can meet tumbling patterns such as up & down, backward & forward, left & right etc. 1. Low Battery Protection: When the indicator lights are flashing, it means Syma X21 is in low battery. At this time, please return Syma X21 to home with your controller. If the battery is insufficient for returning home, Syma X21 will be landed automatically . 2. 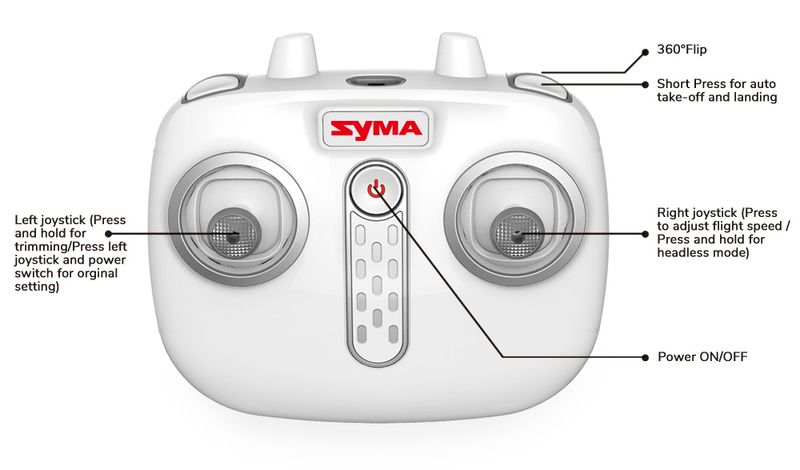 Overcurrent Protection: When the propeller of Syma X21 is being knocked / jammed while in flying mode, the over-current function will automatically stop the movement of the propeller to protect the damage of the drone itself. ABS body shell material, so higher toughness, better corrosion resistance, Streamlined body shape with lower wind resistance.